MANGALURU: Indian Space Research Organisation (ISRO) chairman A S Kiran Kumar on Sunday signaled country's readiness for Chandrayaan II mission, which will be India's second mission to the moon. 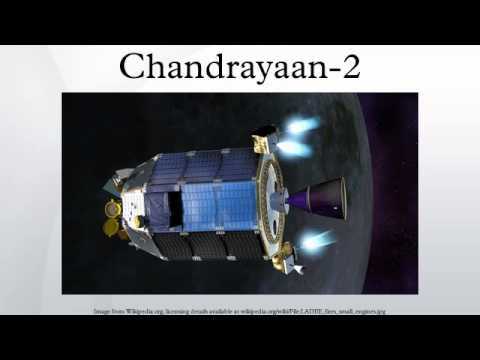 Chandrayaan II is an advanced version of the previous Chandrayaan-1 mission. It consists of an Orbiter, Lander and Rover configuration. It is planned to be launched as a composite stack into the Earth Parking Orbit (EPO) of 170 X 18,500 km by GSLV-Mk II. Kiran Kumar, who was in the city in connection with the international conference on startups, incubators and entrepreneurship and National Science Day at Yenepoya University, said the orbiter carries the combined stack up to moon till the Lunar Orbit Insertion (LOI). The combined stack is then inserted into a lunar orbit of 100 km x 100 km. The Lander is separated from the Orbiter in this orbit. The Orbiter with scientific payloads will orbit around the moon. The Lander will soft land on the moon at a specified site and deploy the Rover. The scientific payloads onboard the Orbiter, Lander and Rover are expected to perform mineralogical and elemental studies of the lunar surface. During 2010, it was agreed that Russian Space Agency ROSCOSMOS will be responsible for lunar Lander and ISRO will be responsible for Orbiter and Rover as well as Launch by GSLV, a note on Chandrayaan II on ISRO website says. Later, due to a shift in the programmatic alignment of this mission, it was decided that the Lunar Lander development would be done by ISRO and Chandrayaan-2 will be totally an Indian mission. Kiran Kumar, who is credited with development of key scientific instruments aboard the Chandrayaan I and Mangalyaan space crafts, gave an insight on achievements and contributions made by the scientists at ISRO including the Chandrayaan I and Mangalyaan. ISRO chief told students that ISRO makes available the data collected by them to the students for research work at their website. Students had an inquisitive interactive session with Kiran Kumar after his address. Yenepoya Abdulla Kunhi, Chancellor, Yenepoya University graced the occasion. Shree Kumar Menon, director, Yenepoya University proposed vote of thanks. Earlier, Dr Akhter Hussein, secretary of Islamic Academy of Education, welcomed the gathering. Preparations are in full swing for India's second moon mission Chandrayaan-2, as potential landing spots on the lunar surface for the spacecraft have been identified. The spots for landing the craft were zeroed in on the basis of photographs taken by Chandrayaan-1, launched by the Indian Space Research Organisation (Isro) in 2008. 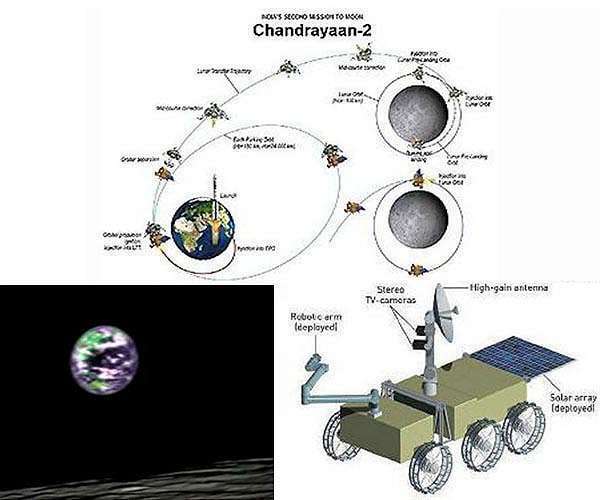 Chandrayaan-2 is an advanced version of Chandrayaan-1, and it aims to demonstrate Isro's capability to soft-land on the lunar surface. Minister of state for PMO V Narayanaswamy recently announced in the Parliament that the mission, which is likely to take place in 2016-17, is progressing well with Isro having identified landing spots on the lunar surface. The two scientific payloads onboard the Chandrayaan-1 terrain mapping camera had captured a number of images of the lunar surface, which have been used for zeroing in on the designated spots. 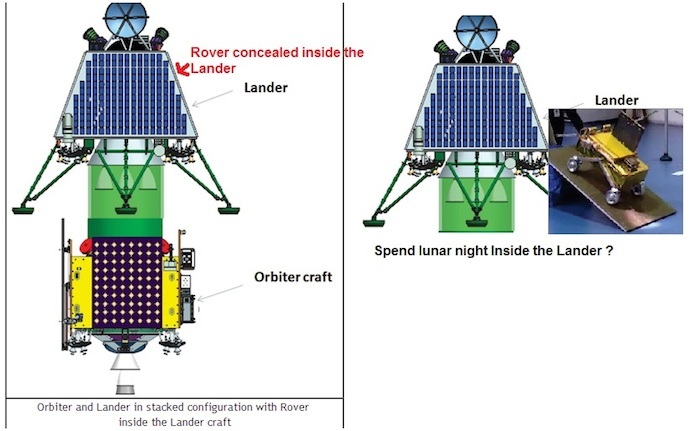 Chandrayaan-2 is configured as a two module system comprising an orbiter craft module and a lander craft module carrying the rover. According to Isro, the orbiter craft with payloads onboard will orbit around the moon and perform the objectives of remote sensing the moon. The payloads on the orbiter will conduct mineralogical and elemental studies of the Moon's surface. The lander craft with scientific payloads will soft land on the lunar surface. A rover released by the lander craft will perform mobility activities on low gravity and vacuum of the Moon's surface with semi-autonomous navigation and hazard avoidance capability. The spacecraft will be launched onboard the Geosynchronous Satellite Launch Vehicle (GSLV). Nagpur: Indian Space and Research Organization's (ISRO) Chandrayaan-II mission will be almost fully indigenous project and its launch, though delayed, is expected to be by 2017 end or 2018 beginning. Earlier, the mission was planned in association with Russian Space Agency ROSCOSMOS. 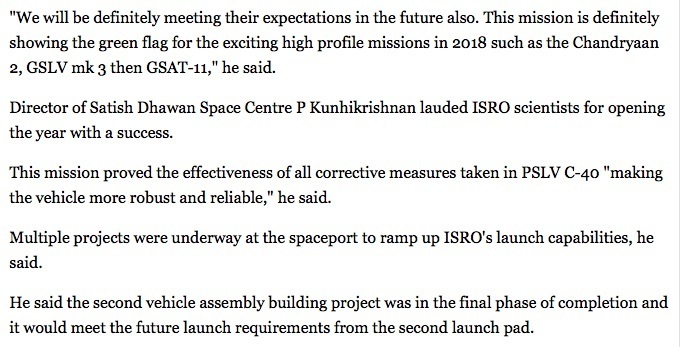 This information was revealed by Suresh Naik, former group director at ISRO, while speaking to TOI on Monday. Naik was in the city for the 10the Late Prof VG Bhide memorial lecture at the Visvesvaraya National Institute of Technology (VNIT) titled 'Chandrayaan, Mangalyaan and beyond'. "With this mission, India takes a shot at converting fiction into reality. Three decades from now, ISRO plans to set up a human base on the moon and also try to produce pollution-free electricity by mining helium-3 which is abundantly available there," Naik said, adding to get to the moon under the 'man mission' and have a habitation there would require a lot of technological development. "An Indian astronaut training facility should form an integral part of the missions. By this year end, ISRO is also planning to launch satellites developed by students. As part of this, the premier space research organization has cleared a project by students of College of Engineering, Pune, for developing micro-satellites using photonic propulsion instead of conventional chemical propulsions," Naik said. He also informed that ISRO is also working towards developing a spacecraft — Aditya — by 2020 which will study the corona of the sun. "Apart from these activities, other plans of launching various communication, remote sensing satellites and GSATs will continue," added Naik. Last Friday, the Indian Space Research Organisation (ISRO) started the first set of a series of ground and aerial tests related to the critical moon landing of Chandrayaan-2. 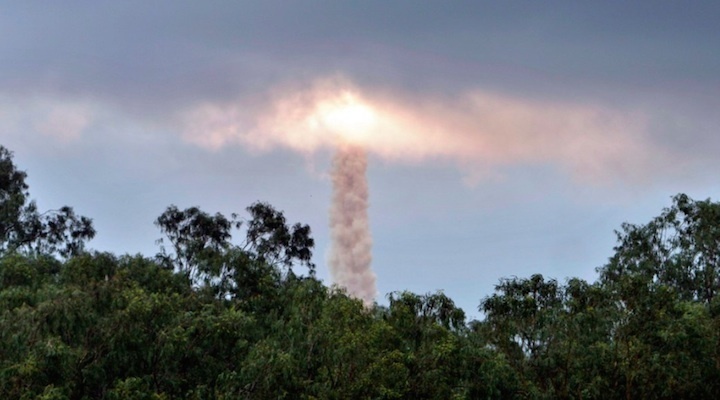 The latest aerial tests took place at ISRO’s new site at Challakere in Chitradurga district, some 400 km from Bengaluru. ISRO Satellite Centre or ISAC, which is the lead centre for the country’s second moon mission, has artificially created eight to ten craters to make the terrain resemble the lunar surface. This terrain is now the test bed for the lunar Lander’s sensors. Between Friday and Monday, a small ISRO-owned aircraft carrying equipment with the sensors flew a few times over these craters to see how well they performed. The space agency, along with other scientific and strategic agencies, owns vast acres of land for its future missions at Challakere, in what is called Science City. Chandrayaan-2 is tentatively marked for late 2017 or early 2018 launch and includes a soft-landing on moon and operating a rover on its surface. Landing on an alien surface is a very complicated activity, said Dr. Annadurai, who was also the Project Director for the successful Chandrayaan-1 of 2008. 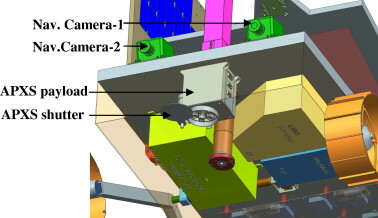 The success of the Lander hinges on the sensors. As the Lander descends from the mother ship or Orbiter, its sensors must judge the distance to the lunar surface. 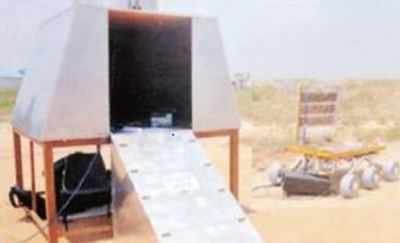 The Indian Space Research Organsiation started a series of ground and aerial tests linked to the critical Moon landing of Chandrayaan-2 on Friday, at its new site at Challakere in Chitradurga district, 400 km from Bengaluru. ISRO Satellite Centre or ISAC, the lead centre for the second Moon mission, has artificially created close to ten craters to simulate the lunar terrain and test the Lander’s sensors. A small ISRO aircraft has been carrying equipment with sensors over these craters to plan the tasks ahead. Chandrayaan-2 is tentatively set for late 2017 or early 2018 and includes soft-landing on Moon and moving a rover on its surface. 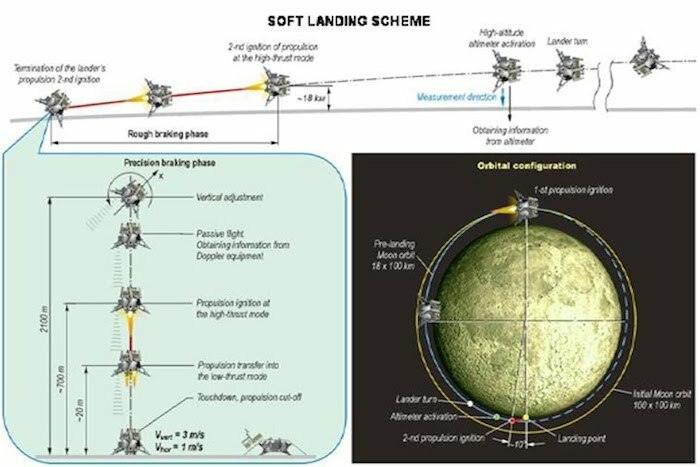 Landing on an alien surface is very complicated, said Dr. Annadurai, who was also the Project Director for the successful Chandrayaan-1 lunar exploration mission of 2008. The Lander’s success hinges on sensors. As it descends from the mother ship or Orbiter, they must correctly judge the distance to the lunar surface, the required speed and the time to hover over the location, for a few seconds. The terrain should enable a smooth landing and steady movement of the Rover when it is released from the Lander. In the coming months up to March, ISAC would conduct many tests: on avionics and electronics; testing the Lander’s legs; and its eight throttlable engines, followed by a combined full test, at Bengaluru and Chitradurga. The mission includes an Orbiter, a Lander and a Rover, all being readied at ISAC in Bengaluru. 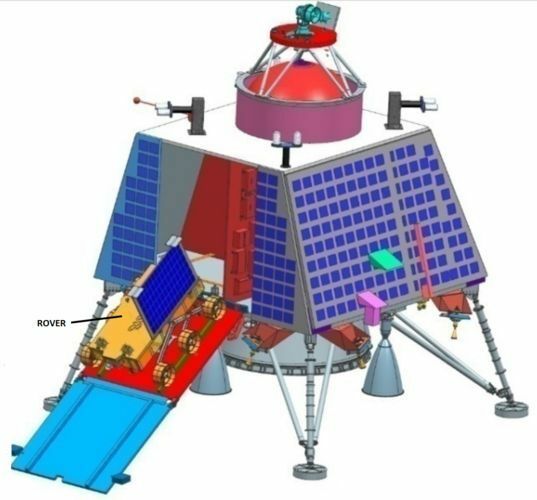 The Orbiter spacecraft when launched from Sriharikota will travel to the Moon and release the Lander, which will in turn deploy a tiny Rover to roam the lunar surface - all three sending data and pictures to Earth. Last week, the European Space Agency’s Mars lander, the Schiaparelli craft, crashed while parachuting to the Martian surface. Asked what lessons could be drawn from this, Dr. Annadurai said they were different in nature. 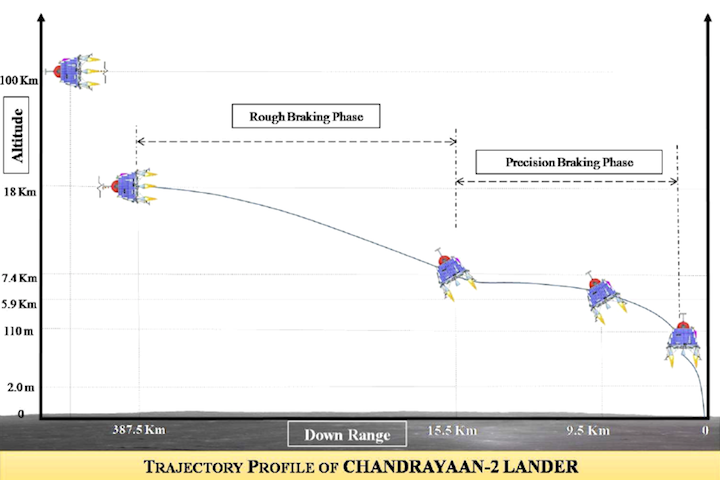 The Chandrayaan-2 Lander does not use parachutes; the configurations and gravity issues of the two missions are different. 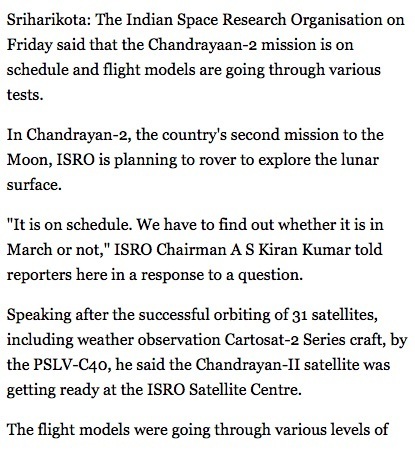 “It still calls for a good amount of testing” for Chandrayaan-2, he said. Launch of Chandrayaan II as a precursor to manned mission to moon will take place in the end of 2017 or early in 2018, said Mayilsamy Annadurai, Director of ISRO Satellite Centre, Bengaluru, here on Sunday. While Chandrayan I could confirm presence of water on moon, the second satellite in the series with orbiter and rover would explore the nature of surface, he told media persons. Testing was being carried out at Bengaluru with a simulator, he said. Mr. Annadurai, who was here to inaugurate new buildings of Erode Sengunthar Primary School, said the plan of launching one satellite a month was progressing well. Similar to tele medicine, utility of satellites could be optimised for educational development, he said. The life of Mangalyan orbiting now beyond the planned six month duration, would be extended further. The embossing of Mangalyan image on the newly released currency of Rs. 2,000 denomination was a unique recognition for his ISRO team, Mr. Annadurai said. The Chandrayaan-2 lander and rover that are being tested for sift landing at Isro's Challakere facility. BENGALURU: Ground tests for soft-landing Chandrayaan-2 on the Moon have begun. Isro has created Moon-like conditions by creating lunar craters in Challakere, Chitradurgha district, to conduct the tests. Once the mission lands on the Moon, the lander and the rover will remain active for just a day. The mission, unlike Chandrayaan-1, which only orbited the Moon, is aimed at placing an orbiter around the satellite and sending a lander and rover to the lunar surface. It's likely to be launched in 2018 using the GSLV-MKII, which Isro is still testing. This is the first time India is using indigenous lander and rover technology. "We should have sufficient time to get good results. The life expectancy of the lander and the orbiter as estimated now is one (Earth) day, which means 14 lunar days. The orbiter will also do rounds of the Moon," said a senior Isro official. The project is estimated to cost Rs 600 crore. Explaining the day-long life expectancy, Isro Satellite Centre (ISAC) director M Annadurai, who was project director of Chandrayaan-1, said: "We will not get enough sun. We will have a long night, and that is why it will work only for a day." During the one-day outing on the Moon, the indigenous rover will be able to move at a speed of 1 centimetre per minute, which means the rover can only cover 1 km of the Moon's surface. "The objective is to achieve two things. One, land the lander successfully and deploy the rover; two, study the surface using payloads on the rover. 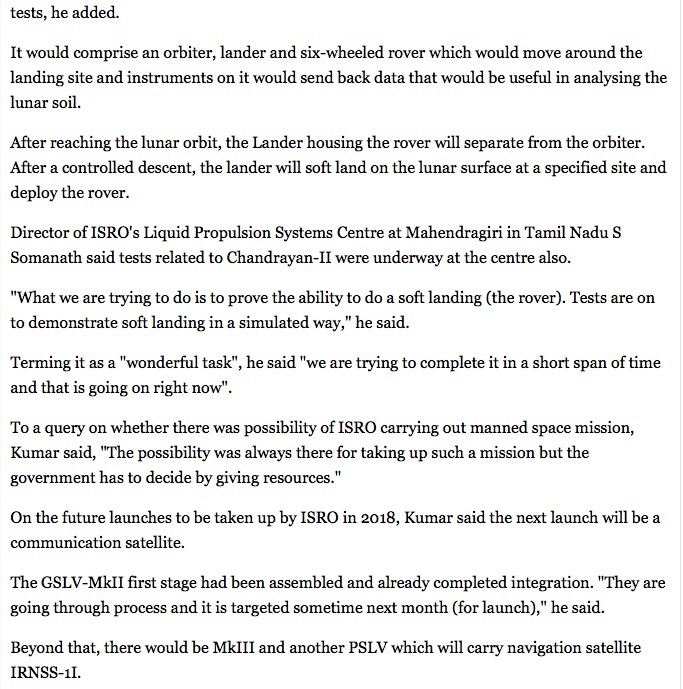 I think we'll be able to achieve both with the current plan," Annadurai said, adding that the rover will be controlled from the ground stations here. While another senior official said the study will also be supplemented by the orbiter, which too will go around the moon for a day, Annadurai said, "The orbiter, I think, will have a longer life. We may be able to get information for about six months." While the initial launch of Chandrayaan-2 was scheduled much earlier, the failure of the Russian space agency Roscosmos to supply the lander has not only delayed the project but also given India an opportunity to make and send its own lander. This is why the space agency has created artificial craters in Challakere, about 200 km from Bengaluru. An officer familiar with the preparations said: "We've created craters measuring 10 in diameter and 3 metres deep. These artificial craters have been created to simulate the lunar terrain. The lander, rover and related electronics will be tested there. The artificial terrain is similar to the terrain where Chandrayaan-2 lander will land." 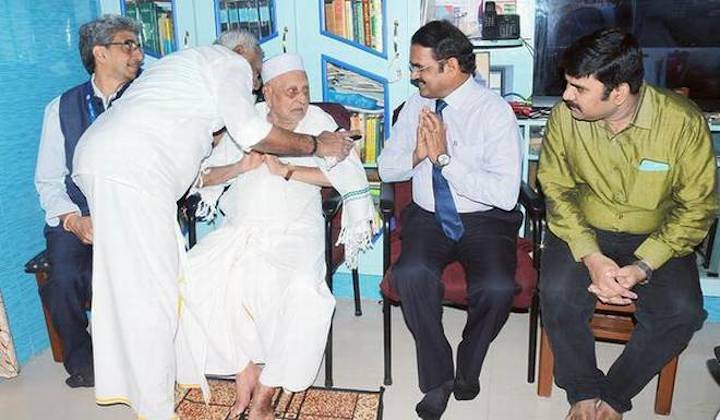 Director of Indian Space Research Organisation, Satellite Centre, Mylswamy Annadurai (second from right), called on APJM Maraikayar, elder brother of former President APJ Abdul Kalam, in Rameswaram on Friday. Students must commit themselves to realising former President and renowned scientist Abdul Kalam’s Vision 2020 and work towards transforming the country into a developed nation, Director of Indian Space Research Organisation (ISRO) Satellite Centre Mylswamy Annadurai said on Friday. Addressing students at Mohamed Sathak Engineering College, Kilakarai, near here, on Friday, he said the former President had great hopes for the student community and it should live up to his expectations and help the country to transform in five areas of its core competence identified by him. Kalam had been a shining example to students that they could achieve anything if they had the perseverance and worked hard, he said adding the late leader had also been a great source of inspiration for him and scores of other scientists in ISRO to scale greater heights. Paying glowing tributes to Kalam, he said when the whole world congratulated him and his colleagues after ISRO’s successful launch of Chandrayaan 1, India’s first lunar probe mission, Kalam simply asked ‘what next’ and suggested that they achieve something bigger. Thanks to the late President’s inspiration, they developed Chandrayaan 2, India’s second lunar exploration mission, which was slated for launch next year, he said. After every achievement, Kalam would ask for more and the unique quality should be emulated by the students, he said. Earlier, Mr.Mylswamy, in a brief chat with reporters, after calling on Kalam’s elder brother APJM Muthu Meera Maraikayar at House of Kalam in Rameswaram, said if India was in top four or five places in the world in space technology, credit should go to Kalam. Since June last year, ISRO had launched as many as 14 satellites. While 10 satellites were designed and developed as per his suggestions, four were designed by students, again, his dream. The development of Chandrayaan 2 was in the final stages and it would be ready for launch early next year. It would be launched using GSLV launch vehicle. Mangalyaan 1, the Mars Orbiter Mission, was performing satisfactorily and preliminary work on developing Mangalyaan 2 has begun. “The second mission will be at a different level and we are working towards that,” he said. ISRO was also developing Adiya L1 spacecraft to study the sun. India’s second unmanned lunar mission will lift off from the Satish Dhawan Space Centre in Sriharikota. India is aiming for the moon, again. Indian Space Research Organisation’s second unmanned moon mission, Chandrayaan 2, will lift off in March 2018, a decade after Chandrayaan 1 was launched, Isro sources told Hindustan Times on Tuesday. 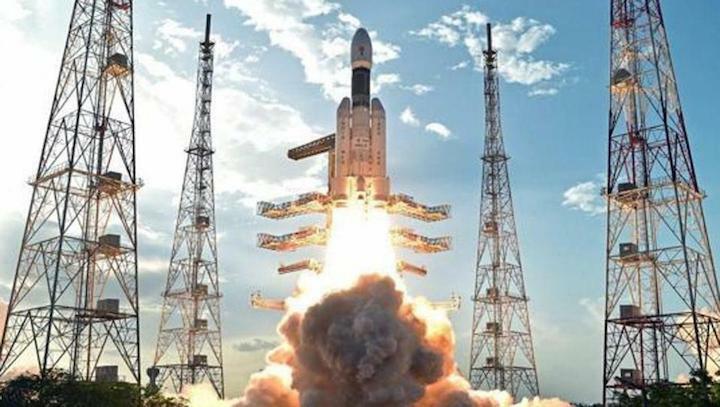 Chandrayaan 2 would be launched on a Geosynchronous Satellite Launch Vehicle Mark 2 (GSLV Mk 2) that will blast off from the Satish Dhawan Space Centre in Sriharikota in Andhra Pradesh, sources said, refusing to disclose the exact lift-off date. GSLV Mk 2 is the largest launch vehicle developed by India and has several successful missions to its credit, Isro website says. Weighing 3,250kg, Chandrayaan (moon vehicle) 2 would have an orbiter, lander and rover. The orbiter would be launched into a lunar orbit where the lander will separate, make a soft landing on the moon and deploy the rover, sources said. It would be an advanced version of Chandrayaan 1 that was a landmark mission for Isro, with India becoming only the fourth country to plant its flag on the moon after the US, erstwhile USSR and Japan. Chandrayaan 1 was launched on October 22, 2008, and included a probe, impactor and orbiter. Its moon impact probe crash-landed on the lunar surface on November 14, 2008. The mission was lauded for costing a fraction -- about $80 million -- of similar missions. The Japanese’s SELENE cost $480 million. Chandrayaan 2 is expected to cost $91 million, yet another example of Isro’s “frugal engineering” — the ability to produce high-end technology at eye-poppingly low costs. The Indian Space Research Organization (ISRO) is conducting a series of tests to prepare for India's second trip to the moon since 2008, Nature reports. The organization is only operating on a $93 million budget, which Nature notes is relatively low for these kinds of missions. The motivation: Preparing for the possibility of human colonization on the Moon. By exploring the planet, India's researchers can better understand the Moon's atmosphere and suitable living conditions for humans. The country's first mission there discovered the presence of water, but the ISRO's next mission hopes to analyze floating lunar dust — particles that penetrate everything from astronauts' suits to space machinery, potentially causing significant damage. The spacecraft for the Chandrayaan-2 mission will include a rover, a lander that will attempt to touch down near the Moon's south pole, and an orbiter that will travel around the Moon. What's different this time: The Chandrayaan-2 mission will test whether India's space technology is capable of pulling off a controlled landing (the original mission ended after 10 months when India's Space Organization lost contact with the orbiter). 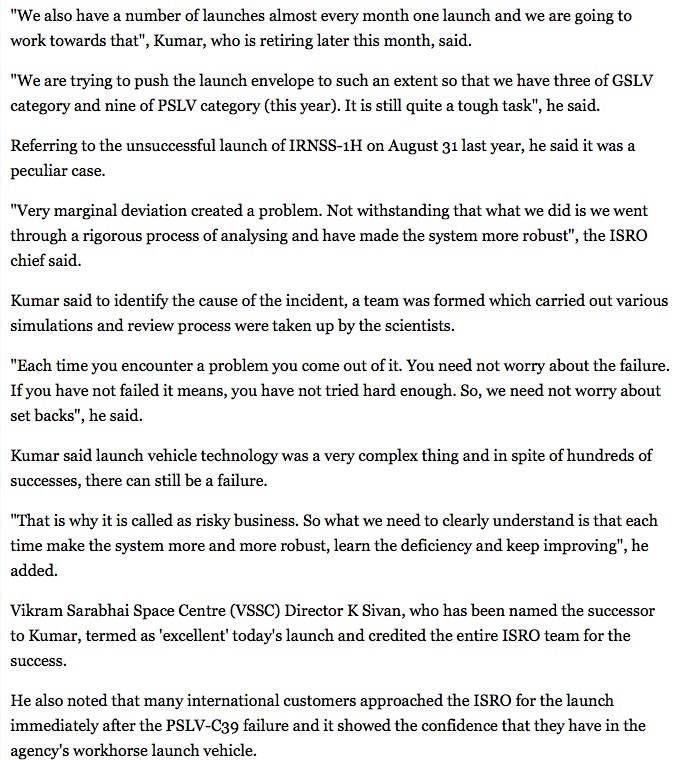 ISRO developed new systems to assist with the soft landing this time around, per Nature. ISRO's tests in preparation for its second mission mimic the Moon's atmosphere and environment: rovers navigate over rocky surfaces in Bangalore. One of the spacecraft's final tests will begin in three to four weeks. The launch of the next Moon mission could be just four months away. India plans to return to the Moon in a big way with the ambitious Chandrayaan-2, which includes an orbiter, lander, and a small rover. If it all succeeds, it will be India's first soft landing on another world, and only the second such landing since the end of the Apollo and Luna era. 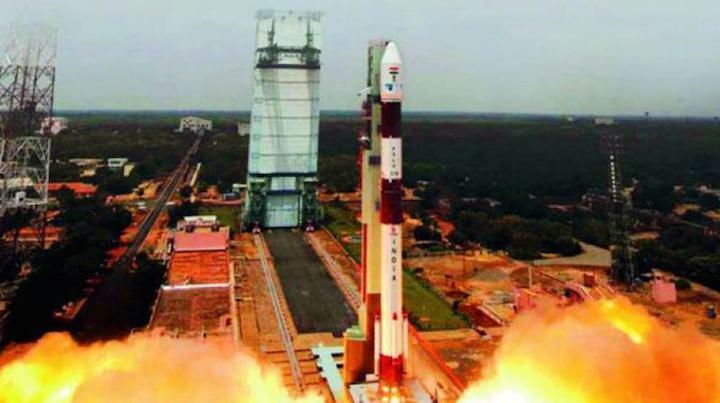 For India, landing success would be "a stepping stone for future exploration missions to other planets," according to Indian Space Research Organisation Satellite Centre (ISAC) director M. Annadurai. The orbiter is a capable one, planned to carry eight instruments into a 100-kilometer, circular, polar lunar orbit, following on the work of India's previous orbiter, Chandrayaan-1. It has a nominal mission lifetime of one year. The lander and rover payloads are more limited, as befits the first demonstration of a soft lander. The lander and rover have nominal lifetimes of one lunar daytime (14 Earth days). I was unable to find any information on whether there is any possibility that the lander or rover could wake up again after the long lunar night, as China's Chang'e 3 lander has done for years. It's enough to hope that India can follow its first and only lunar orbiter with its first lunar lander. The GSLV will place Chandrayaan-2 into an elliptical Earth parking orbit, enlarging it over days or weeks with periapsis burns to raise the orbit apogee. Eventually, the apogee will be high enough that a burn can send the spacecraft on to a lunar transfer trajectory. 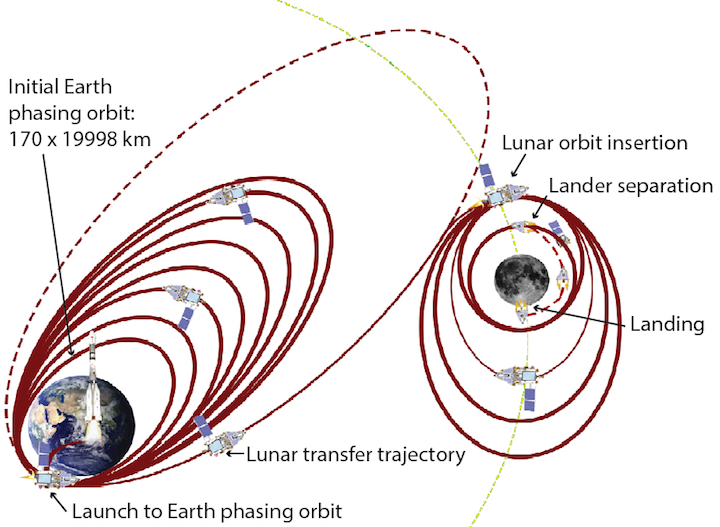 A lunar orbit insertion burn will place Chandrayaan-2 into an elliptical orbit and the spacecraft will begin braking at periapsis to reduce its orbit to a 100-kilometer circle. I haven't found a reference that says how long this process is expected to take from launch to final orbit, but a similar process took Chandrayaan-1 three weeks, from October 22 to November 12, 2008. Modified from a presentation given by ISRO director M. Annadurai to the United Nations Committee on the Peaceful Uses of Outer Space in June 2017. Once the spacecraft is in its science orbit at the Moon, the lander mission can begin. While the orbiter doesn't care much about what phase the Moon is in, the lander and rover need sunlight for warmth and power, so the timing of launch will be dictated by the necessity to get the lander on the ground at its landing site very soon after local dawn. However, the concept of dawn is a bit tricky, because the landing site is planned to be near the south pole. I haven't seen any recent information on the specific landing site choice. As of 2012, an earlier concept that involved Russian collaboration had proposed landing sites that were quite near the South Pole indeed, at 87.2 and 88.5 degrees south. The landing will happen entirely autonomously. The lander will separate from the orbiter and immediately perform a deboost maneuver, changing its orbit around the Moon to one with an 18-kilometer periapsis. When it reaches periapsis, the lander will begin the "rough braking phase," braking to reduce its orbit altitude to 7 kilometers. At an altitude of 7 kilometers, the lander will use a camera to take photos of the lunar surface and determine its relative position and velocity compared to its onboard map of the landing region. The lander will autonomously determine the trajectory necessary to bring it to its desired landing site, and steer itself to a location 100 meters above the site, where it will come to a hover. It will use a hazard avoidance sensor to map the surface for potential hazards and select a safe location for touchdown. The lander will slowly descend until it reaches 2 meters above that location. Then it will cut its engines. The lander will fall to the surface, its four lander legs absorbing the shock of landing. The rover will roll out of the lander shortly after the landing in order to make the most of its brief, two-week primary mission. From M. Annadurai et al. presentation to the 10th IAA Symposium on the Future of Space Exploration, Torino, Italy, 27-29 June, 2017. The orbiter is physically similar to Chandrayaan-1. It is three-axis stabilized with reaction wheels. The orbiter carries five science instruments and two supporting instruments. 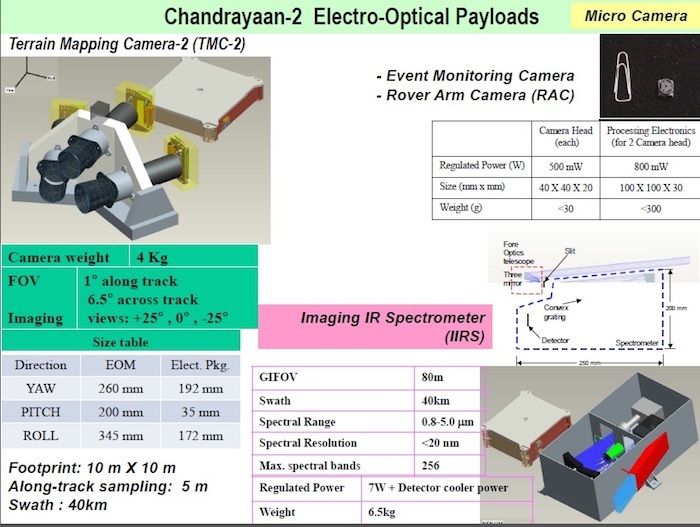 Terrain Mapping Camera 2 (TMC-2) is based upon TMC (a predecessor on Chandrayaan-1) and will perform 3D mapping of the lunar surface using two cameras. Collimated Large Array Soft X-ray Spectrometer (CLASS) is based upon C1XS (a predecessor on Chandrayaan-1) and will map abundance of major rock-forming elements on the Moon including Mg, Al, Si, Ca, Ti, and Fe. Assisting it is the Solar X-ray Monitor (XSM), which measures solar x-ray emission. Chandra's Atmospheric Composition Explorer(ChACE-2) is a neutral mass spectrometer that is based upon CHACE (a predecessor on Chandrayaan-1's Moon Impact Probe). Synthetic Aperture Radar (SAR) will perform radar mapping of the surface in both L and S bands of the radio spectrum. It has heritage from MiniSAR on Chandrayaan-1 but will be the first L-band radar mapper to orbit the Moon. Imaging Infra-Red Spectrometer (IIRS) is sensitive to light with wavelengths between 0.8 and 5 microns and has the specific goal of mapping the abundance of hydroxl ions and molecular water. Finally, the Orbiter High Resolution Camera (OHRC) will perform high-resolution imaging of the landing site prior to the lander mission. Chandrayaan-2 consists of an orbiter, lander, and small rover. Here, the spacecraft is shown in its launch configuration. Physically, the lander is shaped like a truncated square-based pyramid, built around a cylinder that houses the substantial propellant tank. It will perform inertial navigation throughout the descent using its Laser-gyro-based inertial reference unit and accelerometer package, LIRAP. The propulsion system includes four throttleable engines that can each provide 800 newtons of thrust, and 8 attitude rockets of 50 newtons each. The lander will communicate direct to Earth using a steerable, dual-gimbal, S-band radio antenna. The lander has multiple cameras in its Hazard Detection and Avoidance (HDA) system, which it will use to determine horizontal velocity from feature tracking and identify the landing site using pattern matching. HDA also contains microwave and laser altimeters and a laser Doppler velocimiter. The HDA system collects data and instructs the rockets to fire to steer the lander to the landing site. I didn't find any reference that indicated whether the lander has the ability to photograph the landscape it's sitting on. Surely it must, but I don't know. Instrument for Lunar Seismic Activity (ILSA) will study moonquakes. Large enough quakes could allow it to study the Moon's deep interior, potentially from a polar position not accessible to the Apollo seismometers, which would be cool. This experiment will be a lot cooler if the lander is capable of surviving multiple lunar days. Chandra’s Surface Thermophysical Experiment (ChaSTE) will measure thermal properties of the lunar surface. Radio Anatomy of Moon Bound Hypersensitive ionosphere and Atmosphere (RAMBHA-Langmuir Probe) will measure near surface plasma density and how it changes over the course of the lunar daytime. According to a recent Nature article, lunar plasma is thought to participate in the levitation of lunar dust, a problem for future human exploration. And, of course, the lander will carry a rover. The rover is very small, roughly Sojourner-sized, at 20 kilograms. 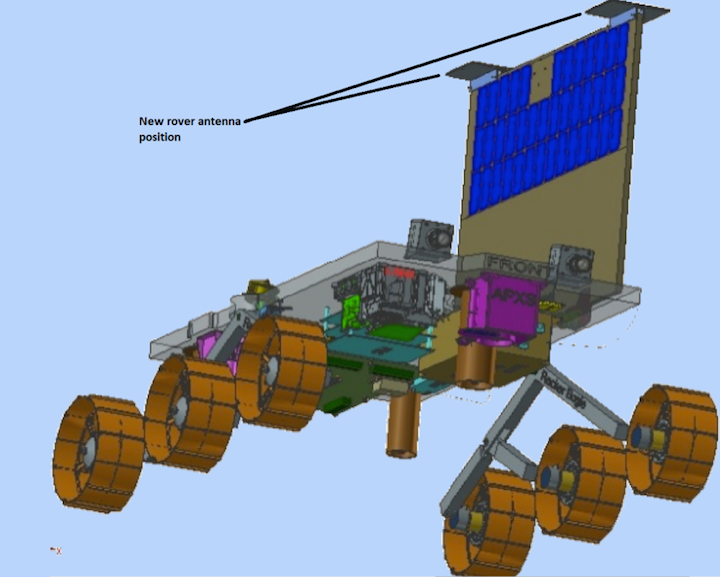 Like NASA's Mars rovers, the Chandrayaan-2 rover uses a rocker-bogie suspension system supporting six independently motorized wheels, but unlike NASA's rovers its corner wheels do not steer. Therefore, it steers by rotating the wheels at different rates, like a tank. This is a perfectly fine method for a lightweight rover as long as the net effect of steering isn't to sink the rover into the soil. To make sure the rover could move and steer on the Moon without embedding, ISRO developed a big sandbox filled with crushed anorthosite to test rover mobility in. When NASA does this with Mars rovers, they build full-size mobility system mockups with tiny bodies so the whole vehicle weighs on Earth what the real rover weighs on Mars, where gravity is a third of Earth's. But that wouldn't work for the already-small Chandrayaan-2 rover trying to simulate lunar gravity at a sixth of Earth's. So ISRO developed a different solution that I just love: attaching a giant helium-filled balloon to a duplicate test rover to counterbalance 5/6 of its weight. These tests succeeded, evidently. 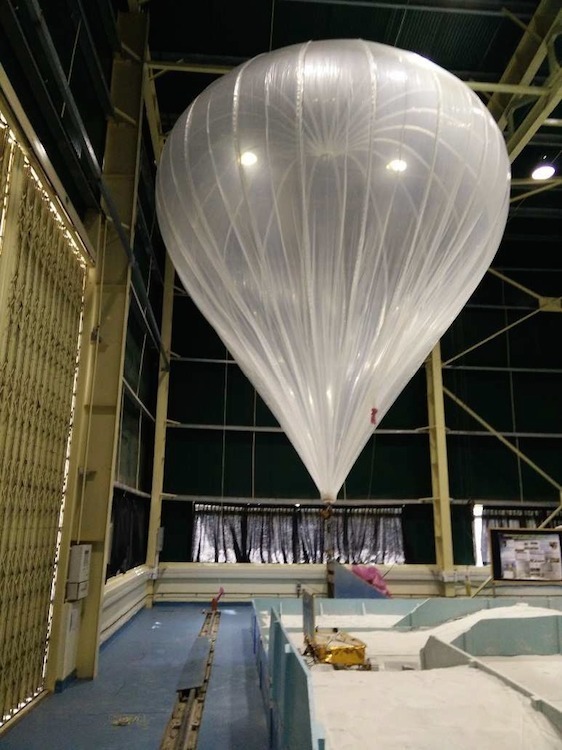 ISRO employs a balloon to counteract 5/6 of the weight of a duplicate of the Chandrayaan-2 rover in order to test its mobility on simulated lunar soil at lunar gravity. From M. Annadurai et al. presentation to the 10th IAA Symposium on the Future of Space Exploration, Torino, Italy, 27-29 June, 2017. Because of its small size, the rover instrumentation is fairly limited, much like Sojourner's was. It has two navigation cameras for stereo path planning and an inclinometer for safety (drives will stop if the rover's inclination or motor current gets too high). It has no rear-facing cameras. It will use a small radio antenna for communication with the lander, which will relay rover data to Earth. The radio antenna is atop its vertically-mounted solar panel. Its solar panel is mounted vertically because of the near-polar landing site. That suggests the rover will need to turn in place after traverses to align the panel for good power production. The rover is equipped with two science instruments for elemental composition, both of which point downward, beneath the rover: a Laser-Induced Breakdown Spectroscope (LIBS) and an Alpha Particle X-Ray Spectrometer. In general, LIBS will get you lower-mass elements and APXS will get you higher-mass elements, with substantial overlap between them. LIBS is faster, APXS more sensitive to trace elements if you can give it long enough integration time. Perhaps they will be using LIBS along traverses, and APXS at stops. Interestingly, a paper I read about the LIBS instrument suggested it was designed for a one-year primary mission. Officially, the lander mission has an expected lifetime of 14 days, but maybe there is hope that it will survive a lunar night to do science on a second lunar day. That would be awesome. But any successful landing at all would be an enormous accomplishment for India; I don't want to get greedy. Originally, Chandrayaan-2 was supposed to be a collaboration with the Russian space agency, but budget problems made Russia drop out, and India decided to go it alone. If Chandrayaan-2 succeeds, India's next step will be lunar sample return. They'd be following exactly the same path China has at the Moon, going quickly from a successful orbiter, to a lander/rover, to autonomous sample return. Unlike China, however, India is using international collaboration to increase its chances for success; Indian prime minister Narendra Modi and his Japanese counterpart Shinzo Abe signed an agreement a couple of weeks ago to collaborate on a future joint lunar sample return mission. A lot of people are trying to make the separate Chinese and Japanese/Indian lunar efforts into a race. To be sure, there is some national pride riding on successes in space, and reaching milestones first. But races have only one winner. We all win when more organizations launch scientific missions into space. All of these countries have shared the data they gathered during past missions with scientists and the public. India's mission landing near the south pole, and China's landing on farside, will only enhance global understanding of the Moon, regardless of who gets there first. India or China may yet be defeated by physics -- deep-space exploration is challenging -- but they won't be defeated by each other's success. Good luck, saubhaagy to ISRO and India on the upcoming launch of Chandrayaan-2! Many thanks to Sriram Bhiravarasu for providing me some papers I used as sources for this article. ‘Chandrayaan-II’ would be launched during March-April 2018, by using a Geosynchronous Satellite launch vehicle. Chandrayaan-II’ would be launched during March-April 2018, by using a Geosynchronous Satellite launch vehicle. The country’s second mission to the Moon, ‘Chandrayaan-II’ would be launched during March-April 2018, by using a Geosynchronous Satellite launch vehicle (GSLV MK II). This prestigious mission will include a lunar, Orbiter, lander and rover, said Dr. Mylswamy Annadurai, director, ISRO Satellite Centre, Bengaluru. Addressing a press conference at Tiruchy on Saturday, he said that they were preparing three unmanned vehicles for the mission developed in India including an orbiter craft, to hover above the moon’s surface, a rover, and a lander to facilitate the landing of the rover safely on the moon. This lunar mission will use and test various new technologies and conduct further experiments. The wheeled rover will move on the lunar surface and will perform a chemical analysis on site, he said. Dr Annadurai said the orbiter will orbit the moon at an attitude of 100-km and create a detailed three-dimensional map of the lunar surface. The mission will carry five instruments on the orbiter namely, a large area soft X-ray spectrometer for mapping significant elements there on the lunar surface, L and S band synthetic aperture radar for probing the first few tens of metres on the surface of the moon for presence of constituents like water. 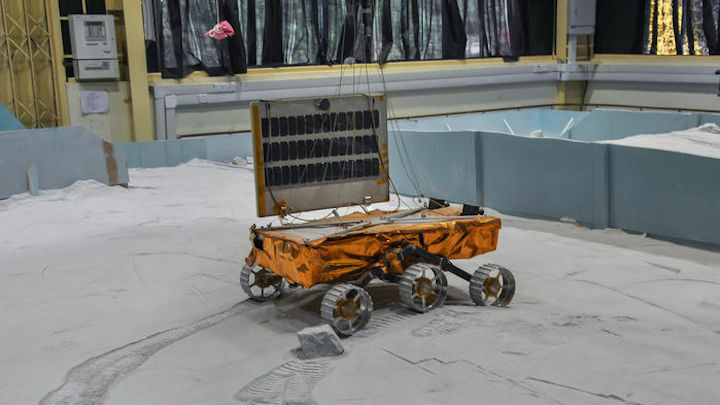 A model of Chandrayaan-2’s rover undergoing tests to prepare for operating in the moon’s anemic gravity. BENGALURU, INDIA—Sometime this summer, a spacecraft orbiting over the moon's far side, out of contact with controllers on Earth, will release a lander. The craft will ease to a soft landing just after lunar sunrise on an ancient, table-flat plain about 600 kilometers from the south pole. There, it will unleash a rover into territory never before explored at the surface; all previous lunar craft have set down near the equator. That's the ambitious vision for India's second voyage to the moon in a decade, due to launch in the coming weeks. If Chandrayaan-2 is successful, it will pave the way for even more ambitious Indian missions, such as landings on Mars and an asteroid, as well a Venus probe, says Kailasavadivoo Sivan, chairman of the Indian Space Research Organisation (ISRO) here. Chandrayaan-2, he says, is meant to show that India has the technological prowess "to soft land on other heavenly bodies." But lunar scientists have much at stake, too. "There has been a rebirth of lunar exploration across the globe, and India can't be left behind," says Mylswamy Annadurai, director of the ISRO Satellite Centre. Instruments aboard the lander and rover will collect data on the moon's thin envelope of plasma, as well as isotopes such as helium-3, a potential fuel for future fusion energy reactors. The orbiter itself will follow up on a stunning discovery by India's first lunar foray, the Chandrayaan-1 orbiter, which found water molecules on the moon in 2009. Before that, "It was kind of a kooky science to think that you'd find water" there, says James Greenwood, a cosmochemist at Wesleyan University in Middletown, Connecticut. "Now, we're arguing about how much water, and not whether it has water or not." Cameras and a spectrometer aboard the Chandrayaan-2 orbiter could help settle that question. India's space agency, the Indian Space Research Organization (ISRO), is prepping for its second mission to the moon, which is scheduled for blast off around April 2018. The objective for the venture is to explore the lunar south pole. Dubbed Chandrayaan-2, the spacecraft is expected to take an estimated one to two months to reach lunar orbit. Once the craft is in position, a lander will then detach itself and navigate toward the Earth's moon. After touching down on the rocky surface, a rover will depart the lander and begin its exploration of the southern region. "Chandrayaan-2 is a challenging mission as for the first time we will carry an orbiter, a lander and a rover to the moon," K. Sivan, chairman of the ISRO, told the Times of India. "The rover has been designed in such a way that it will have power to spend a lunar day or 14 Earth days on the moon's surface and walk up to 150-200 metres. It will do several experiments and on-site chemical analysis of the surface." "The rover will then send data and images of the lunar surface back to the Earth through the orbiter within 15 minutes," the chairman added. Since the rover can only store up to 14 days' worth of power, Sivan indicated that until it is able to collect enough sunlight and recharge itself, it will remain in sleep mode. "We are hoping the rover will again come alive whenever that part of the moon gets sunlight and recharges the rover's solar cells," Sivan said. "Besides the rover, the orbiter will also capture images of the moon while orbiting it." When asked about a more concrete launch date, Sivan told the publication that it depends on several different factors. "All three components of the lunar module are almost ready. Currently, their integration is going on," he said. "Once the module is ready, it will have to go through rigorous tests. The launch date will depend on various factors like the moon's relative position with respect to the Earth." The spacecraft, which will be launched using a Geostationary Satellite Launch Vehicle Mark II rocket, is set to take off from the Satish Dhawan Space Center in Sriharikota, in the southeastern state of Andhra Pradesh. Prior to the Chandrayaan-2, the agency launched the Chandrayaan-1 in October 2008. Though the mission was expected to last for two years, it only lasted roughly 10 months after the orbiter stopped communicating with the station in August 2009.